Can you believe it's November 2nd!?! Well, it is and guess what that means...the holidays are right around the corner! It's time to get festive and I have partnered with THE HEIGHT to show you 2 amazing tall dresses for your holiday soirees. Today's look is for the casual get-together, candle light service, tree decorating party and the list goes on and on. Obviously this tall sweater dress can worn throughout fall and winter months but the vibrant red, midi length and the actually long enough sleeves make this dress perfect for the holiday season. So red isn't your thing? Never fear. THE HEIGHT had the same exact dress in blue and olive at the same wonderful price point of $52. I paired the sweater dress with these killer patent ankle boots from Long Tall Sally, some tights and a faux leather vest but you can wear it by itself with some flats, throw a blazer on with some basic black pumps or even throw on a long line vest with some lace-up boots...there are a plethora of ways to rock this tall dress. So now that your casual holiday dress is taken care of, it's time for the fancy smancy fit. I have one on the way. Stay tuned to TallSWAG to see my pick. HINT: It's a show stopper! Ah. The infamous tunic. You know...the shirt that is supposed to go past your booty but usually ends up just looking like a typical shirt on us. Yep. That tunic. Well, today I have a real, tall tunic that shatters all of your tunic disappointments. It fits just like a bonafied, tried and true tunic should. Long, with long arms and full booty coverage. Cha-ching my tall friend! The Two Pocket Tunic Shirt is one of the new arrivals in the Long Tall Sally Spring Collection. I am obviously in love with the fit, but also the versatility and vibrant color. This season, blue has in many ways become the new black so you can rock it in many different ways with many different colors and patterns. I love pairing blue and black together and stripes are my jam right now so I whipped up this look and absolutely love it. And before I get any comments...yes...this is the hat you have seen in like 3 of my other posts. Listen, I wear things more than once (gasp). In addition, I have a rather large head which makes selecting hats a difficult task. Thus, when I find one that works, I rocketh it ofteneth. 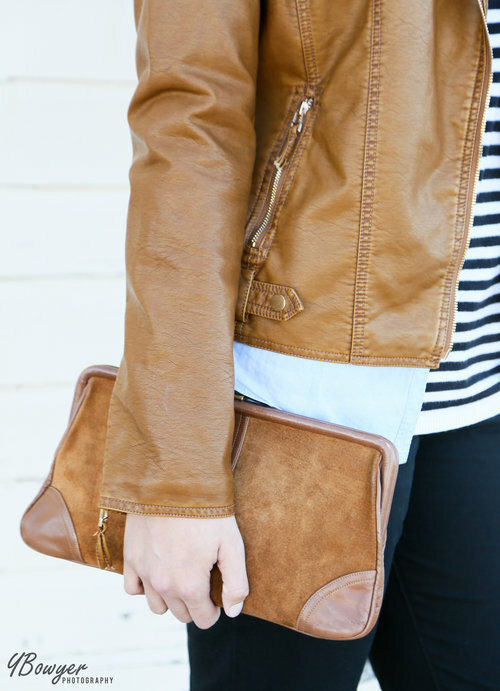 I also have to talk about this crossbody clutch. I found the actual clutch at a used bag place in Oakland for $6.99. It had an ugly rope handle, so me with my DIY self, cut it off and replaced it with black chain and clasps. I love it because you can adjust the length really easily with the clasps and, well, it looks cool. I really want to say something else whitty but it's 1amish and I am one tired tall girl so I leave you to sleep and have sweet dreams. Smooches! Hello my Pretties! I hope you are having a day filled with light and crazy joy! If not, stand tall and walk confidently through the haze until you get there. This Tall Bomber Style Jacket is brought to you by Talltique. It's by the actual Talltique brand and made from eco-friendly vegan leather that looks and mostly feels just like the real stuff. It has a 29.5" arm length and can be worn in many different ways. One thing, make sure you check the sizing before you order. I am wearing a size 2 and I wasn't even a size 2 at birth. It's a fabulous staple for any Tall Girls closet. If Caramel isn't your thing, it also comes in black. The layers of shirts are prime examples of what I constantly talk about. The striped top was one of those I tried it on in the store and ohmygosh it actually works pieces and the Tall chambray top is a Tall basic I ordered online that was a little pricey but totally worth it because I use it as a foundation for SO many outfits. I mean I have worn this bad boy so many times that the cost has become obsolete (at least that is what I tell myself). The shoes, the shoes! So...I searched the globe for size 12, chic slip-ons that didn't require me to donate one of my organs to pay for them. No dice. But then, out of the clear blue sky, (I am so dramatic) arose a perforated, sleek pair that goes up to size 13 for the glorious price of $19.99. Run that debit pronto. By the way, Payless, go on ahead and make a Tall Sista (specifically me) the face and voice of your extended sizes. Please and thank you. Lastly, the busted knee jeans. Sigh. I couldn't find a pair to save my life. If I did, they were high-waisted and even though I live for a good pair of those, that's not what I wanted in my busted knee beauties. So, I took the task into my own hands and busted those knees right out of an old pair of 37" alloy jeans I had. I just put the jeans on, placed scotch tape where I wanted them busted, took them off (very important), made a small cut and then ripped them open. Wow. That sounds like an episode of Criminal Minds. Of course, right after doing so, life presented a Tall pair from ASOS. Don't be shocked if you see them in a post. So there you have it...my little slice of casual Heaven. What do you flaunt on your kickback days? The idea that stripes make you wide has been thrown out the window this season. Striped apparel is everywhere complete with clean lines (pun intended) and figure flattering construction. One thing you can't do, is wear too much of the trend. Too many stripes = an outfit that will confuse people and more then likely cause dizziness. My favorite way to wear the trend is in a nice, clean, simple shirt. Check out these tall options below (I threw in a cute dress too). My personal fav is the tunic from Lanky Bird. Basically, anything I can wear with leggings and boots is winning right now. Which one would you wear?